Barack flies to Moon! Palin gender-swap shock! Biden Bidet now $9.99! 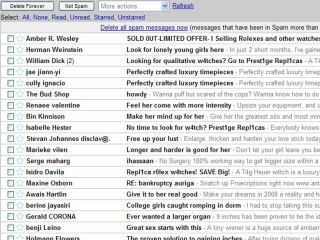 For one month every four years, spam gets serious. Out go offers of all-night passion, lists of dentists and discount Rolexes, in come surveys, economic indicators and missives from 'Balack' and 'Pain'. Network infrastructure company SonicWall is forecasting that more than 5 billion political spam emails will reach the in-boxes of registered US voters in the 30 days prior to the November 4 Presidential Election. SonicWall product manager Andy Klein warns of three types of political-oriented spam, the most common of which (accounting for around 90% of messages) uses the election as a hook to get you to open the spam message, URL or attachment. The second, making up around 7% of spam, will be advocacy spam where a person or group sends spam to sway voters. Political email does not have to conform to the Can-Spam Act, so Barack Obama and John McCain are actually free to spam at will. Finally, phishing emails will account for about 3% of political spam. 2004 saw the first phishing email based on a political race, utilizing a John Kerry campaign contribution ruse to collect credit card information. But don't worry, Vi*gra fans, spam will soon be back to normal. SonicWALL predicts political spam will constitute just 1% percent of all spam by the end of Election Day.